Updated & Expanded for 2018! 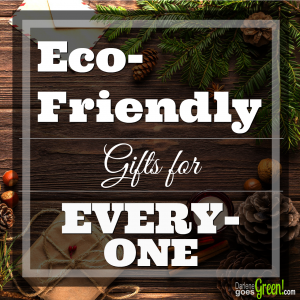 Gift-giving can sometimes be a challenge to our eco-friendly goals, but it doesn’t have to be! Here’s my ultimate green list to make your gift-giving easier and a whole lot greener! Click the green descriptions for product links! Keep leftover fruits, vegetables, and drinks fresh without plastic! These food-grade silicone covers slip on easy and keeps cut food and opened drinks fresh longer. Fits on glass jars too! The set of 5 is under $13! 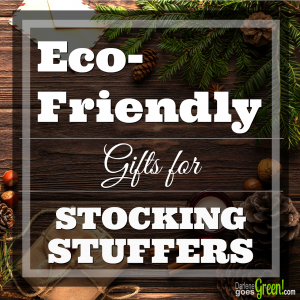 Sustainable and biodegradable, these long-length golf tees are perfect for any golfer! These sustainable bamboo jar lids not only do the job without plastic, but look awesome on the countertop. Perfect for both practical use and decorative! Pack of 3 and available in both regular and wide mouth size. Soap scrubbing pouches are awesome and machine washable. There are some premade ones available, but these are so easy to make, you’ll want to make them yourself! Click the link for instructions from Whimsy-Love.com, but ditch the commercial soap and adjust your measurements for your favorite eco-friendly handmade soap bar, like this one: Almond Biscotti Soap Bar. These awesome highlighters are made from sustainable, natural basswood is long-lasting and completely biodegradable. Plus, they don’t bleed through the thin paper making them great Bible highlighters! Package of 6 different color highlighters and a wooden sharpener. See my review of Eco-Highlighters HERE. Kindle books are great on Kindle devices, but thanks to all of the Kindle apps available, you can read (paper-free) from almost any device including your desktop! There are thousands of titles available for gifting. This little guy fits perfectly in your hand and is the perfect shape to clean your pots and pans with renewable, certified organic bamboo. Only $2.50! Certified organic lotion in a convenient carry stick! These long-lasting, versatile lotions are great to throw in your purse or diaper bag and double as a giant lip balm! 6 scents to choose from and only $9. Made from recycled newspaper and packaged in recycled kraft paper, these colorful pencils are perfect for coloring projects and are eco-friendly too! These sealable and reusable “zip top” bags help keep plastic baggies from ruling the world! Fill them up with fair-trade chocolate, organic tea, or other fun fillers for two gifts in one! Available in a variety of colors and in three sizes from snack to a ½ gallon! You can see my review of Stasher Bags HERE. A fair-trade and certified organic chocolate for everyone on your shopping list! Based in Seattle, WA, Theo chocolate has is on a mission to make great chocolate “thorough stewardship at every stage in the agricultural and manufacturing process.” A huge selection of chocolates and candies are available on their website, but I’ve also seen a growing selection available in local stores. These certified organic acne sticks zap the blemish without chemicals! My teen son recommended them for this list! This adorable cupcake set offers 16 mix-and-match cupcake pieces to create and display on it’s own pretty blue cupcake stand! The set is made in the USA from 100% recycled materials and printed with safe soy inks. These bright and colorful trucks are made from recycled milk jugs in the USA! The California company uses 100% recycled materials for all their toys and package them in basic 100% recyclable cardboard. The dump truck is available in 3 fun colors, including pink! These environmental and kid-friendly finger paints are made with natural earth clay, fruit and vegetable pigments. Eco-Dough and Eco-Crayons also available and all three are made in the USA! Perfect Noah’s Ark set for all your favorite kiddos! Made from sustainable bamboo wood and painted with non-toxic water-based paint, this giant arc would make a wonderful Christmas or Baptism gift. Includes a huge ark and seven sets of animals in recycled packaging. Every baby needs a shape sorter and this one is a winner. Made from solid hardwood maple, each shape is sanded smooth and engraved with the 6 shape names and numbers for early education. Ages 18 months and up. They make a fun wooden Shape Sorter too! At just over $10, this fun garden kit makes it easy for kids to grow their own “pizza”…or at least some yummy toppings! Kit includes 6 packages of Seeds (Sweet Basil, Heirloom Rutgers Tomatoes, Green Bell Peppers, Greek Oregano, Italian Parsley, Scallions), Starter Soil, Pizza Recipes, Wood Plant Markers, Growing Instructions, Pencil and 100% Recycled Fiber Egg Carton Planter. The pictures make this look like a lot of fun! Perfect first pull toy for little ones! Made with eco-friendly materials including rubberwood, e-zero glue, and water-based dyes, Plan Toys arrive in recycled and recyclable packaging. They also have a Dancing Alligator pull toy which is equally as adorable! 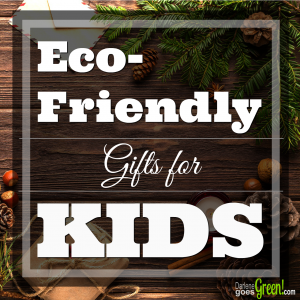 An eco-friendly crafting set for kids of all ages that are handmade and assembled in Colorado. The set includes a handmade, reclaimed wooden carving knife (safe for small hands), shaping tool, instructions in a screen printed fabric bag ready for gifting! All kids love music and these chemical-free rubberwood toys are non-toxic and made with both water-based paints and non-formaldehyde glue. They come in awesome bright colors and ready to play! Click for links: Xylophone, Drum, Tambourine. Your kids will love making and using their own lip balm! Includes everything needed to make 6 lip balms, 3 twist up tubes and 3 jars with no fillers or synthetic dyes for $20. We LOVE bath bombs, especially handmade! If you don’t have time to make them yourself, these luxurious bath bombs are handmade in the USA by a small group in Rutherford, NJ and are minimally packaged individually in environmentally-friendly tissue paper. Win-win! Made in the USA from locally sourced 100% beeswax, these awesome and eco-friendly candles are sure to please your candle lover! Available in 3 sizes and 2 scents: Mint, Clove Bud & Sweet Orange. Wax melts make homes smell great! For only $6 and made with organic coconut wax and organic essential oils, these candle melts from Poofy Organics last up to 30 hours per cube and smell incredible. Includes 6 cubes and available in 12 toxin-free scents. Pair your favorite candle wax scent with a long lasting wax melter for a gift she’ll love! 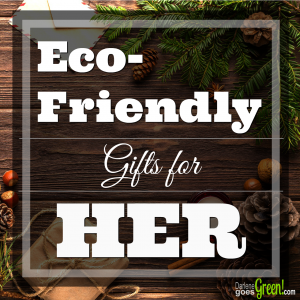 Toxin-free beauty needs eco-friendly tools! With a ton of options, these brushes are cruelty-free and made with recycled materials, renewable bamboo and tree-free packaging. Sets start at only $8. Local classes like pottery or crafts are so much fun especially with friends, but online classes are awesome too. Craftsy.com and other online classes are both entertaining and convenient with classes offering everything from cooking to photography! For her or any wine lover, these wine glasses come in a set of 4 different colors for easy identification and are perfect for outside parties. Clean up is easy too — they are dishwasher safe with the sleeves on! Girls love nail polish, but they don’t love the dangerous chemicals that come along with beautiful nails. Yuck! This toxin-free nail polish is safe for kids and those suffering from allergies and cancer. Approx. 100 colors to choose from! Everything from a recycled bike spoke bangle to a handmade evening clutch from a satin tie, you’ll find a ton of unique gifts on Etsy! These great bowl covers are a bit of a throwback, but one worth bringing back! A great alternative to plastic wrap or foil, they are great for meal prep, storage, and keeping the bugs away at outside events. Set of three, handmade in Canada. Online subscriptions are green and awesome. Think radio, streaming tv, newspaper, magazines, and more. Here’s one my husband loves —it’s a great explanation of the weekend’s mass readings which often ends up being a gift for the whole family: Catholic Productions, Mass Readings Explained Subscription. For the bearded man in your life, this pocket size “Grow a Beard” grooming toolset can fit easy in his pocket to keep his beard shiny and smooth on the go! 100% Biodegradable too! Everyone deserves at least one awesome, reusable beverage bottle and these by Bubba Brands, don’t disappoint! They keep hot beverages hot and cold beverages cold —for hours! A variety of colors and types available. See my full review and favorites HERE. I listed this one under gifts for “him,” but I’m putting this one on my Christmas list too! It is made from natural bamboo wood and looks awesome on any desk. At under $50 it’s a great value too! Holds up to 5 phones or tablets and keeps your cords and wires organized and out of sight! The 100% natural bamboo is sustainably harvested from a Forest Stewardship Council Certified forest. Conscious Step Socks — Socks that give back! These socks not only look great with their awesome designs, but they are also fair trade and ethically made with organic cotton. Their process is simple, transparent and supports a variety of causes from animal rescue to providing water to those in need. Sharing gifts with those in need is an excellent way to honor anyone on your gift list! There are many local and global charities who would be grateful for the donation. Visit your local Catholic Charities or click here to find a chapter near you. A set of 4 small sized bowls perfect for salad, fruit, ice cream or popcorn! They look great on the table and feel good in your hand. 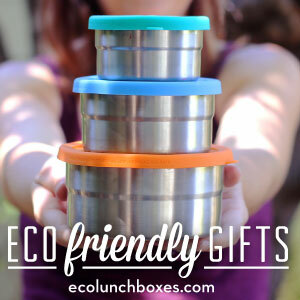 Give the gift of a safe lunch to your favorite teacher or student! The set comes with a substantial sized stainless steel oval lunch box and a leak-free snack cup in simple, giftable packaging. At only $24, it’s not only a great gift, but a good deal too! Concerts, classes, and dance lessons, oh my! Think outside the gift box and consider giving a fun and entertaining gift instead. Weekend trip to the city (or wine country), ski lift tickets, comedy club, boat trip, theme park passes, sports tickets, the possibilities are as big as your budget! These vintage look sunglasses are lightweight, polarized with UV lenses and come in seven colors with their own storage box. Perfect for pool or beach lovers — they float too! All the convenience of microwave popcorn without the chemical leaching bags! This 1-quart glass popper is made out of laboratory grade, non-leaching glass, and silicone. Plus, it takes less than 3 minutes to pop your corn and butter it too! 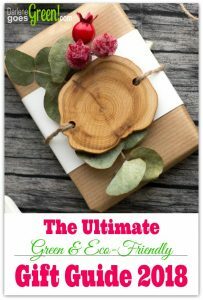 Your gardening friend will love this recycled gift tin filled with garden markers, a pencil, and 6 organic herb variety seeds. Each is labeled with its own message and cheerful symbolism: Dill/Cheer, Oregano/Peace, Sage/Gratitude, Thyme/Health, Basil/Harmony, Garlic Chives/Laughter. It’s a thoughtful and attractive gift for under $30! Kindle books are great on Kindle devices, but thanks to all of the Kindle apps available, you can read (paper-free) from almost any device including your desktop! There are thousands of titles available for gifting! These furry little wool balls are a plus for every eco-friendly laundry. Reusable for a year (or more!) they are green, economical and effective for static-free clothes load after load. Add a few sprays of Dryer Ball Oil by Poofy Organics and clothes smell great without chemicals too. Biodegradable and compostable! These plastic wrap alternatives do everything from cover leftovers to wrapping your lunch. Eco-friendly, they can be used over and over and seal with just the heat of your hands. Once they’ve lost their usefulness, they can be tossed in your backyard compost! An affordable, made in the USA Orbee-Tuff flying disc your dog will be sure to love! They are non-toxic, durable and recyclable too! With two sides of toxin-free scratching, this cozy resting spot will be your cat’s new favorite place! The lounger’s patented design is made from 100% recycled materials in the USA and 10% of sales go to the Amanda Foundation Mobile Clinic in California, making it a gift for your pet and one in need. These non-toxic hemp rope toys are not only great fun for your dog, but they’re also biodegradable and made in the USA. They come in three sizes at a great price from $5-11. This bright and colorful dog fetch toy is ready for fast action play and is recommended even for tough chewers. It’s 100% recyclable, non-toxic and made in the USA. 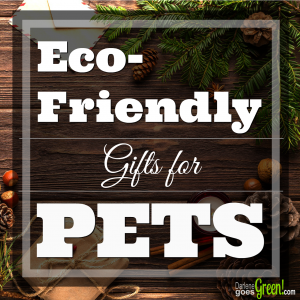 Did I miss your favorite green gift? Let me know in the comments below, I’ll love to check it out and add it to the list! *Disclosure: I may earn a small affiliate commission when you purchase from some of the links on this list. Your cost is the same, but your purchase helps support my work, so I will be able to continue to share my “going green” journey. Thank you for your support!